Connect With Our Skilled Roofers in Kamloops! Building a new home or re-roofing your old one? Are you looking for skilled roofers? Call T & N Roofing for professional and complete roofing services. Our experienced roofers handle sloped and flat roofs for renovations. We are the go to roofers for new construction projects. Founded in 1990, T & N Roofing has employed and trained roofers for more than two decades. It is our experience that sets us apart and makes us stands out in any roofing project. T & N roofers have not come across a roofing issue we haven’t tackled. We are dedicated to completing your roof on time and within budget. Call us to set up an appointment or email us to request your free quote! 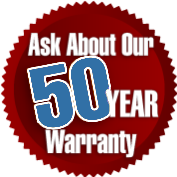 Ask us about our 50 year warranty! If you have any questions about our roofing services and would like more information, please contact us. Simply fill out the form on this page with your name, phone number, email address, and comments. One of our roofers will reply to your inquiries as soon as possible. Thank you for your patience.